We are thrilled to announce the new BETA release of DAP v4.8 and LiveLinks v1.12. This release only has one new feature but it’s an awesome and much-needed feature. We work very hard to make DAP more efficient and the external integrations more robust. If you use DAP for Membership management and AWeber for Email Delivery, you are going to love this new integration! Watch this short, 5-minute video that shows you how the new DAP=>AWeber integration works! Why Is This Integration Better? => The new API integration is super simple to setup and far more efficient and reliable than the current email-based integration. You no longer have to worry about subscribers not getting added to AWeber because of email delivery issues or because of communication issues between AWeber and your Web Host. The new integration will also allow you to send user’s membership password to AWeber. You can use AWeber to send out ‘Welcome’ emails instead of sending it from DAP. This is especially useful if you are on shared web-hosting and use your web host to deliver welcome emails but you constantly end up with email delivery issues. AWeber has an automatic double opt-in configured that will send an opt-in email to any contacts you add to the AWeber list. The good news is – if you use the new API integration, AWeber will allow you to setup the new lists as single opt-in. If you want the list to be single opt-in and not require confirmation, just contact Aweber support and request that they disable the forced opt-in for your new lists. 1. Visit DAP Admin => Email => AWeber Integration page. 2. Click on the link to “Authorize DAP to Connect to Your AWeber Account”. A new browser window will pop up. It will contain an AWeber authorization form. 3. Enter your AWeber credentials and click on “Allow Access” to complete the authorization. AWeber will generate an authorization key. 4. Copy the authorization key. 6. Click on “Generate AWeber Keys” to generate and save the keys in the DAP database. This will allow DAP to communicate with AWeber via APIs. Please NOTE: Only use this integration if you want to add users from DAP to AWeber. If the users are being added to DAP first (paid or free product) and you want the users to be automatically subscribed to an AWeber list, use this integration. Do NOT use this integration if you use AWeber webform to signup users. If the integration is from AWeber=>DAP, use this documentation. 1. Visit DAP Products/Levels => Manage page. 2. Select the DAP product that you want to integrate with AWeber. Replace <aweberListId> with the list Id of your AWeber list. When the user is added to this product in DAP, they will be automatically subscribed to the configured list in AWeber. If you want to send user’s dap membership password to AWeber, enter this string in the “Plugin Notification Upon User Add” textbox. Please NOTE: Replace <aweberListId> with the list Id of your AWeber list. 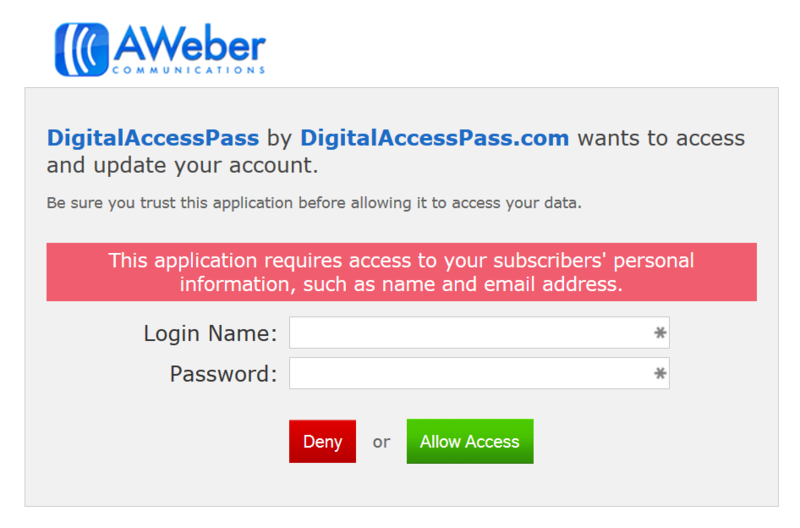 This will allow DAP to send the password to AWeber and also subscribe user to the AWeber list. You can use AWeber (instead of DAP) to send out welcome email with membership login credentials to your users. If you don’t find a “Password” field in AWeber, please define a new custom field called “Password” in AWeber. The DAP password will be stored in that field. Please NOTE: Replace <aweberListIdFrom> with the list Id of the current AWeber list. Replace <aweberListIdTo> with the list Id of the new AWeber list to which the users will be moved. If you remove a user’s access to this product in DAP, the user will automatically be moved to the new list in AWeber. To use this feature, you will have to upgrade to the new BETA release (DAP v4.8 / LiveLinks v1.12). Download DAP v4.8 and DAP-WP-LiveLinks v1.12 zip files from your members’ area on our site. a) You can use the DAP Easy Installer plugin to upgrade DAP to v4.8 and LiveLinks to v1.12. => Download DAP v4.8 zip file from the members’ area on our site, unzip it and upload it to the root folder on your site overwriting the existing contents of “dap” folder. Install the new BETA release (DAP v4.8 / LiveLinks v1.12) to use the new AWeber integration. You can use the DAP Easy Installer plugin (or use regular FTP) to install DAP. This new version of DAP v4.8 and LiveLinks v1.12 is free for all Dappers with current upgrades & support. This is a great enhancement. Thanks! Brilliant! This will make life much easier when setting up a new product – thank you Veena and Ravi. Sounds good. Just wondering when the Beta for the new shopping cart interface is done? I’d like to give it a shot, but my site is very “live” so not sure if I should yet. But I need help, how to send aweber password? I configured this way: aweber::sendpassword replacing the ID of my list. That’s right? Because I did it that way to try and password does not come out. Maybe missing something I do not know. The delimiter (as I mentioned in the video) is colon (:). Test this with a new subscriber. If the user gets added to AWeber successfully, the integration is working. When you compose your welcome email in AWeber, you can use the tag for “Password” that you will find in the Personalize Email section. Fantastic. How did you get Aweber to agree to the single optin as they usually require the list to be a year old before they will let you move it to single optin? Any update on Sendy integration? The Password field showing me the image does not exist in my account Aweber. Do I have to create it? If you don’t find it, please create a custom field called “Password” in AWeber. This is great! But I’m having trouble getting the password into my welcome email in Aweber. I assumed it would be under personalization the same way email is, but there’s nothing there. This article stresses the fact that we don’t have to create a custom field, so how do we actually send the password in the welcome email? When we tested it, it was already there in our account and we assumed it would be there by default. Will I need to create a password field for each AWeber list that I’ll be integrating with DAP? Does DAP generate and send to AWeber a password for each new user even though there’s no password field in the DAP “Free Signup” Form Code? My AWeber auto-response message would need to include the password variable in order to display it, correct? If you are already using AWeber => DAP integration, then you don’t really have to convert to this model. You can setup the dap product as a single opt-in product (remove double opt-in content from Notifications tab). This way when the user signs up using AWeber webform, they will be auto-logged-in to DAP. They do not have to wait for a welcome email with their login credentials. But if you have paid products, then yes, use this new integration to automatically add users to AWeber. Thanks for your updates. It’s great to see DAP evolve. I use RapidMailer from IMSuccessCenter.com. As it’s a WP Plugin and has most of the features of AWeber, I don’t have to pay the montly AWeber fees. I haven’t yet tested RapidMailer with DAP. Do you (or anyone) have any experiences, successes or known issues? Thx. This is cool! Even though I just left Aweber yesterday it is a great improvement in DAP! Look forward to it being out of BETA for other clients. I am almost done with my Sendy integration and got some great ideas from this new feature in DAP! Thanks for constantly improving Digital Access Pass! Any chance of GetResponse email integration? DAP already integrates with GetResponse the same way it does with AWeber. I’m a new “Dapper”, and I’m impressed by the amount of responsiveness you give to your users! This updated version is a perfect case in point! Great job! That being said, as I’m setting up my first DAP based site, I’ve been leaning toward your recommendation of using DAPs email tools with Amazon SES. Now that this new version of DAP is out with Aweber integration, do your recommendations change at all? In other words, do you recommend using Aweber now over DAP+Amazon SES? That helps a lot, thanks! I will look into the pros/cons of saving by using DAP with SES vs spending more to get the analytics. Excellent update and much appreciated! Everything seems to be working fine except the name which is not propagated from DAP to Aweber. Is there anything you can do about this? I would like to be able to use the “!firstname_fix” field in my emails from Aweber. AWeber APIs have a ‘name’ field and not separate firstname/lastname fields. DAP sends firstname + lastname in the ‘name’ field to AWeber. As long as the first/last name is registered in DAP, it will get sent to AWeber. If that’s not happening, please open a support ticket with us, and we will troubleshoot it. I have had a couple of sales since and it is still not working. Aweber approved the single opt in to all lists that I’m using the api. On a typical product in DAP in the 3rd part notification box I have: aweber:putt-vids-books I reconnected the aweber authorization key as well, then tested with a $1 test product, no success again. I have no idea, seems straight forward. If you are using dap 4.8.1 and have configured everything correctly, it should work. There are no known issues with this integration currently and a lot of DAP users are using it successfully. Please open a support ticket with us so we can troubleshoot it and find out the cause. I’ve successfully integrated dap with aweber + single optin is activated. to send 2 e-mails to new customers (dap + aweber) where only one can do the job. Sure. You can remove the welcome email subject/body content from DAP Products page => Notifications tab. Is there a way to move DAP members between multiple AWeber lists based on either a specific DAP product they get or specific product chaining? For example, if I have 3 levels in DAP and my user is on Level 1 (both in DAP and an AWeber Level 1 List), if s/he buys into Level 2 or 3 through DAP, I’d like to automatically move that user from my Level 1 AWeber List into the relevant Level 2 or Level 3 AWeber list. As I understand it, the aforementioned “aweber:move” option is only one move to one specific list, but it doesn’t seem dependent on where the user transitions to in the DAP funnel/buying process. How do I add them to multiple aweber lists? Can I still keep the original list they were in in aweber and just have them added to a new one? I don’t have to move them from one to another if I don’t want to correct? Also with this new weber API they will not be getting any double optin notification email unless I want them to? correct? In the plugin notification section, you can add a comma-separated list of all the aweber lists to which you want to add the user. Can I still keep the original list they were in in aweber and just have them added to a new one? I don’t have to move them from one to another if I don’t want to correct? Correct. Please talk to aWeber support to turn off double-opt-in for your lists.